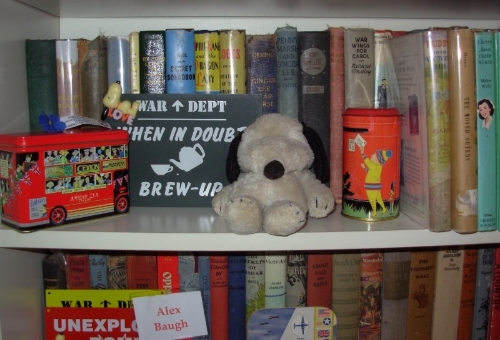 I would like to give a big Thank You to Barbara over at March House Books Blog for giving my blog this Very Inspiring Blogger Award. Barbara, as you may or may not know, has one of the loveliest blogs on the block and I love visiting it and seeing all the wonderful images she post there from old books and postcards. Thank you so much, Barbara, I am delighted to accept this award. ✔ Display the award logo on your blog. ✔ Link back to the person who nominated you. ✔ State 7 things about yourself. 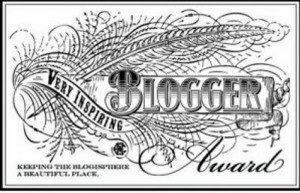 ✔ Nominate other bloggers for this award and link to them. ✔ Notify those bloggers of the nomination. the Statue of Liberty or taken the Circle Line, but I pass by them a lot. This is sadly still true. 2- I love cats, but prefer black cats. Alas, I no longer can have cats because of severe allegories. 3- I always wear my socks inside out because the seam at the toe annoys me so much. Still true. 4- I collect snow globes. I added two new ones this past year. chicken noodle soup. Still true and something I eat a lot since Newtown. 7- I never eat dessert if it doesn’t have chocolate in or on it. Still true. So fun to learn these interesting facts about you! I don't live very far from NYC and I have made a list of sights I should go visit, simply because I never have. So I am right there with you! I can understand why you wear your socks inside out. It makes sense to me. You're welcome and I hope you enjoy the award. It seems like everyone is being hit by large amounts of spam all of a sudden. Really annoying! Good grief! So the robot is an eavesdropper too? I'm sorry you have to do this although I will gladly go through the captcha process. So tell me this - have you visited the High Line? I want to see that someday. I knnow, spammers are annoying and everywhere suddenly. UGH! No, I haven't been to the High Line yet. I was thinking maybe in the spring, when things have just bloomed and it isn't too hot yet. I'll let you know if it is worth it. Hi Alex, lovely to find out a little more about you, glad you liked getting the award. I'm starting to get loads of spam from Mr. Anonymous too, so will have to follow your example and go back to word verification - it drives me mad, but I don’t see another way around it. Sorry it took a while to comment the days just fly past.